Are you planning to replace an interior door or two? If you’ve already been to your local home center, you probably found yourself slightly overwhelmed by the huge selection available in the window and door department. You might wonder, “Why so many choices? And which is the best option for my home?” Good question. This article will give you the answers you’re looking for. Not every home is the same, and so not every home has the same requirement for an interior door replacement. Interior door choices include 6-panel, flat, 2-panel, arched, molded, and a host of other kinds. Some doors are embellished with rosettes or other carpentry details. Select your new interior door to suit the style of your home, as well as your personal taste. Equally important is the actual size of the door. For most homes, an average bedroom door might be 30" wide and 80" tall. (In the trades, it's often called a 2'6" by 6'8"). But other common sizes range from 2' wide to 3' wide in 2" increments; another common height is 78", or 6' 6". Be sure to measure your interior door size carefully before heading out to purchase a replacement. Next, figure out whether you need a right-handed or left-handed door (referring to the direction the door opens in). An easy way to tell which is which is to straddle the threshold with your back to the hinge side. If the open door is on your right, it is right-handed; if it is on your left, it is left-handed. double doors, also known as French doors, an elegant decorative touch where space is not an issue. 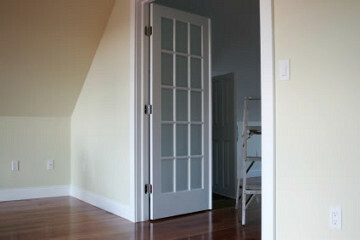 The choice to install a slab door often hinges on whether or not the new door will match the existing jamb. If so, it is a more economical way to go. Some unique skills may be required, such as mortising hinge locations and boring for a lockset, and sometimes adjusting for width and length. But these tasks can be completed by an experienced DIYer. Replacing the existing door with a new “pre-hung” eliminates the need for those special skills, but brings others to the job, such as shimming, leveling and plumbing and installing trim molding or casing. Some pre-hung doors are built with a split jamb and thus already have the trim installed. This eliminates the need to cut miters. While interior door replacement is doable by a skilled do-it-yourselfer, you might not have the time or inclination to try this at home. Fortunately, it’s easy to find a reliable handyman who will install your interior door quickly and professionally. Whether you do it yourself or hire a pro, a new door will improve the look and value of your home.